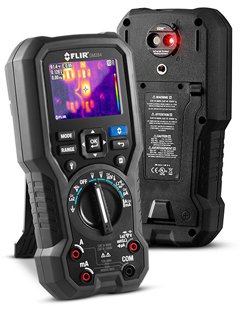 Instantly spot electrical issues and get more done with the 160x120-resolution FLIR thermal imager. 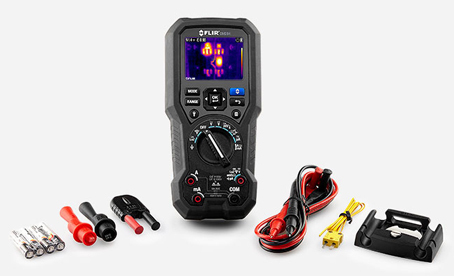 Plus, the all-in-one tool is convenient to carry on you so you always have access to thermal imaging. Featuring 18 measurement functions including True RMS, LoZ, and NCV, you can verify potential issues with trusted readings every time – even for the most complex measurements. The DM284 also includes a thermocouple input and allows you to view thermal and electrical measurements simultaneously. The simple user interface is intuitive to use and the thermal camera features 3 color palettes to choose from. Built-in worklights and a laser pointer help you access difficult locations with lighting issues and pinpoint the location of the problem in the thermal image.